Filed to: The Devil is a Part-Timer!Filed to: The Devil is a Part-Timer! They’ve reluctantly put aside their differences to fight angels and save a city, but are the Devil and the Hero up to the task of raising a child together? After defeating the angel Sariel and rival food chain Sentucky Fried Chicken, Maou (also known as Satan!) and the rest of the crew retire to the Devil’s Castle (their musty old apartment). Now that Suzuno has been discovered as a high inquistor from the Church, it’s her turn to make amends as she takes Maou shopping in compensation for her accidental killing of his noble steed Dullahan (known as a bicycle in human parlance). When they return to the Devil’s Castle with Emi Yusa (also known as the Hero) in tow, they suddenly witness the arrival of a magical baby Alas Ramus, who identifies Maou as her father! However, the shock continues when she calls Emi “mommy!”, forcing the Devil and the Hero into a reluctant and awkward domestic partnership as they try to raise this child. The Devil King and his ever growing stable of companions return to everyday life after defeating Sariel, continuing their enjoyable banter as they attempt to scrape by in modern Japanese society. The banter between these characters continued to grow on me in this volume, and happily the growth of the series’ cast kept it feeling fresh by providing a wider range of interactions. I enjoyed that the comedy has grown beyond coming primarily Emi and Maou bickering, taking advantage of all of the characters in a satisfying way now. Little side interactions such as Maou and Suzuno bickering over buying a new bicycle for Maou were fun, playing off the various personalities of these characters excellently in this volume. 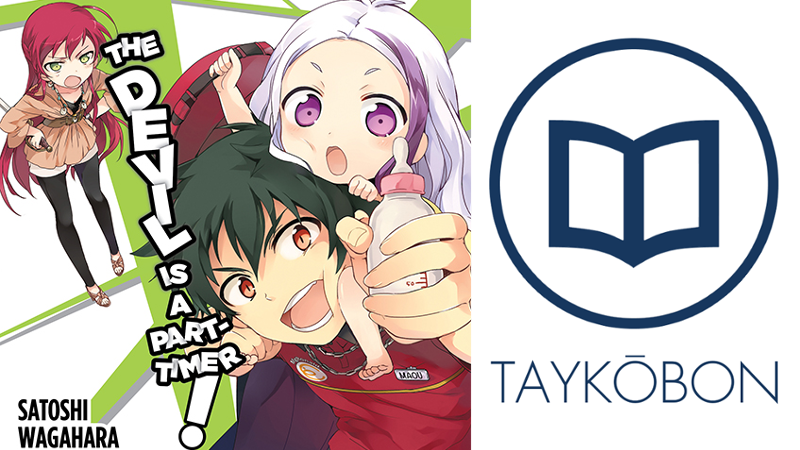 The major plotline in this volume forced Maou and Emi to grapple with raising a child, using this as the catalyst for most of the comedy and story development. This was an entertaining break from Maou’s work at MgRonald’s and lent itself to some funny moments as he and Emi attempted to put their differences aside to provide for Alas Ramus. It gets even better as the rest of the gang has to get involved along the way, providing the opportunity for character development (and for Alciel, romance!) that I appreciated. This storyline was also quite heartwarming, providing some excellent characterization for Maou and Emi along the way. The best part was that Maou’s backstory is finally explored, answering many of the lingering questions about his past in a fascinating way. This revealed a lot of depth to his character, and I felt a lot more invested in the overall storyline as a result because it reconciled what I had felt were inconsistencies in his character. This was also excellently framed and didn’t come off as forced, potentially making way for some very interesting future story develop. Overall, this was an excellent and extremely enjoyable part of the story which fans following the series up until now will be sure to appreciate. Additionally, the bigger-picture story of the side-effects stemming from the conflict on Ente Isla is involved, as Alas Ramus is part of a bigger mystery involving the church that Emi, Maou and crew are forced to deal with. Somewhat predictably, Alas Ramus’ appearance involves our merry crew in a new conflict, as angels quickly arrive to take her back. I’ve found the overarching Ente Isla plotline to be getting a little tiring and distracting from the tone of the story because most of it is explained in exposition, making it difficult to really care what the church is up to compared the Maou’s daily struggles at MgRonalds. I felt this volume did a better job making it a little more relevant and tangible, and I liked that there appeared to be longer-term implications in the conclusion compared to the more episodic nature of the first two volumes. Combined with Maou’s new character development, this volume gave the plot a better sense of direction that really engaged me with the series and I’m excited to find out what will happen in future volumes. One of my favourite parts of this series has been the sarcastic and occasionally absurdist narrative voice that author Satoshi Wagahara uses to highlight the ridiculousness of many of the proceedings. This continues effectively in this volume, utilizing enjoyably overdramatic description which create humour out of otherwise mundane moments such a buying a bicycle or going to the theme park. I also appreciated that it never became too overbearing or cynical, simply accentuating the proceedings through this enioyable description. The narration is also the cause of one of this series’ bigger nagging annoyances, as conversations often proceed without any indication of who is talking. This gets especially distracting in the later parts of this volume, as there a few scenes with groups of characters in conversation where it is difficult to pick out who is talking due to the sheer number present. While this is resolved to some degree thanks to the personality and modes of speech imbued into these characters, it gets confusing in shorter statements made by these characters making it more difficult to follow along than it should have been. The Devil is a Part Timer! Vol. 3 continues this fish-out-of-water series enjoyably, providing some crucial revelations about these characters in an engaging and interesting way. It’s always fun to watch these characters bicker and bounce off each other and this volume really benefits from slow expansion of the cast, keeping the proceedings fresh. Although the Ente Isla storyline is still a little bit too far out there compared to the rest of the plot, this volume does a great deal to address this, engaging me further in the overall direction of the plot. Fans of the series won’t want to miss this volume for its comedy and plot advancement, making this volume easy to recommend as an enjoyable read. The Devil is a Part-Timer! Vol. 3 was published by Yen Press on December 13th, 2015. Authored by Satoshi Wagahara and illustrated by 029 (Oniku) the series is currently ongoing and published by under ASCII Media Works’ Dengeki Bunko imprint. The series received a one-cour anime adaption in Summer 2013 and volume 4 will be published in English on April 21st, 2016.